A pair of Victorian three-seat walnut Chesterfield sofas, each of typical form with rolled arms and two-seat cushions, on the original casters, reupholstered in deep-buttoned and distressed black leather, English, circa 1870. 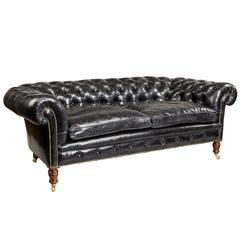 A fine late Victorian Chesterfield, of typical from with turned walnut legs and refurbished castors, reupholstered in deep buttoned distressed black leather. A deep-buttoned Victorian Chesterfield, of typical form with scrolling arms and back and generous seat cushions, re-upholstered in distressed claret leather, English, circa 1900.